Packed with 100% natural goodness: Valencian orange. 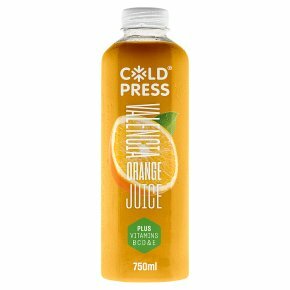 It's coldpress for goodness sake! Suitable for vegetarians.Only 66 calories* *per 150ml serve A 150ml serving of this juice is one of your 5 a day. Vitamin C contributes to the protection of cells from oxidative stress - damage caused by free radicals. Indices based on a 150ml serve. Vitamin C (mg) 1.09 per calorie Vitamin C 90% of NRV* Antioxidants (mg) 17.6? per calorie *Nutrient Reference Value ?As mg of gallic acid equivalents By championing cold pressure over traditional heat treatments our juices are perfectly placed to celebrate all the amazing tastes and nutritional wealth that makes great fruit and veg a daily must!